It is generally difficult to make a magnetic liquid because once you melt a magnetic material (for example iron) it will no longer be magnetic. This is because the melting point for iron is 1000˚C, but its Curie point (the temperature when magnetic materials lose their magnetism) is 800˚C. A ferrofluid, however, is liquid at room temperature and becomes strongly magnetized in the presence of a magnetic field. 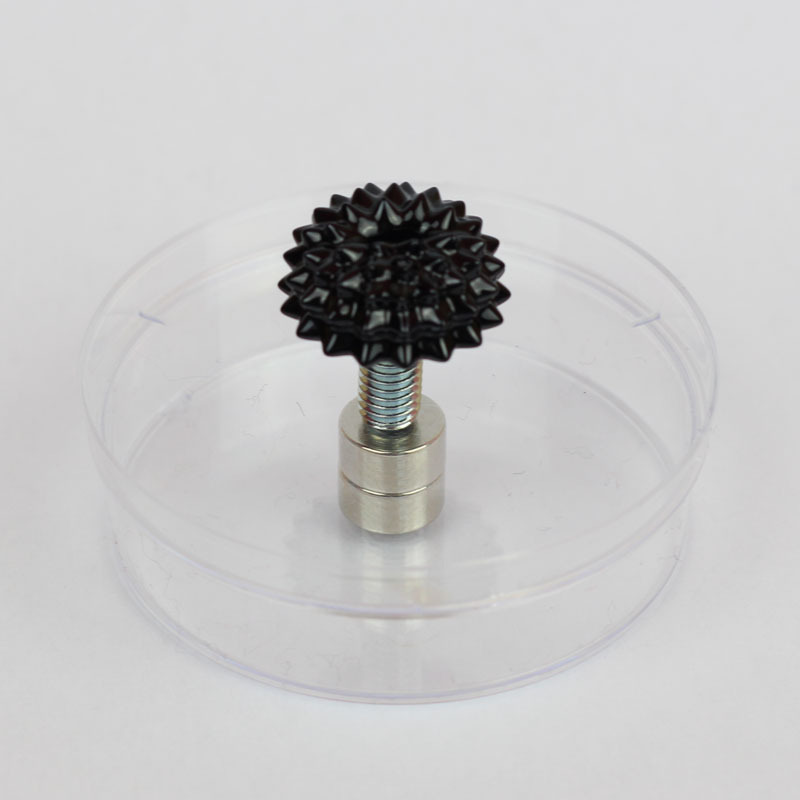 This means that you can use ferrofluid to visualize the magnetic field it is placed into. 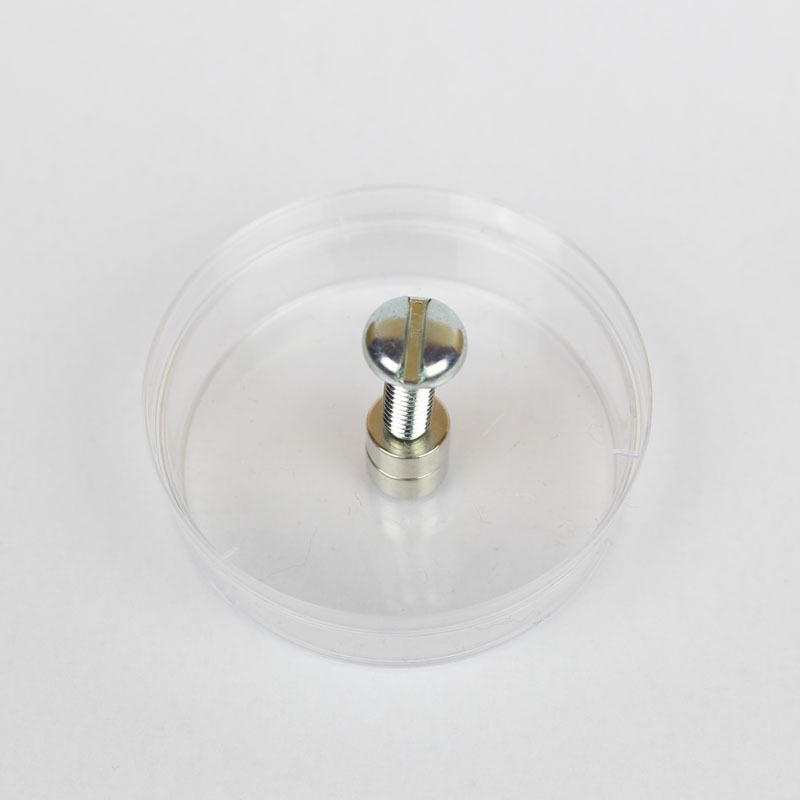 If you are a teacher and you are teaching your students about magnets or working with magnetic fields, then this kit will integrate perfectly into your lesson plan. The experiment can be either a hands-on activity for your students, or the perfect demonstration that blasts the traditional iron-filings experiment out of the water. The kits are also perfect for those who never grew up and still like to ‘geek out’. Ferrofluid’s unusual properties will intrigue people who both have and haven’t heard of it before, because it’s one thing to see a video of ferrofluid, and a very different thing to see it in real life! Ferrofluids are made from ferromagnetic nanoparticles approximately 10 nano-meters in diameter, suspended in a carrier fluid (usually an organic solvent or water). Each tiny particle is thoroughly coated with a surfactant (a substance which tends to reduce the surface tension of a liquid) which prevents clumping even when a magnetic field is applied. 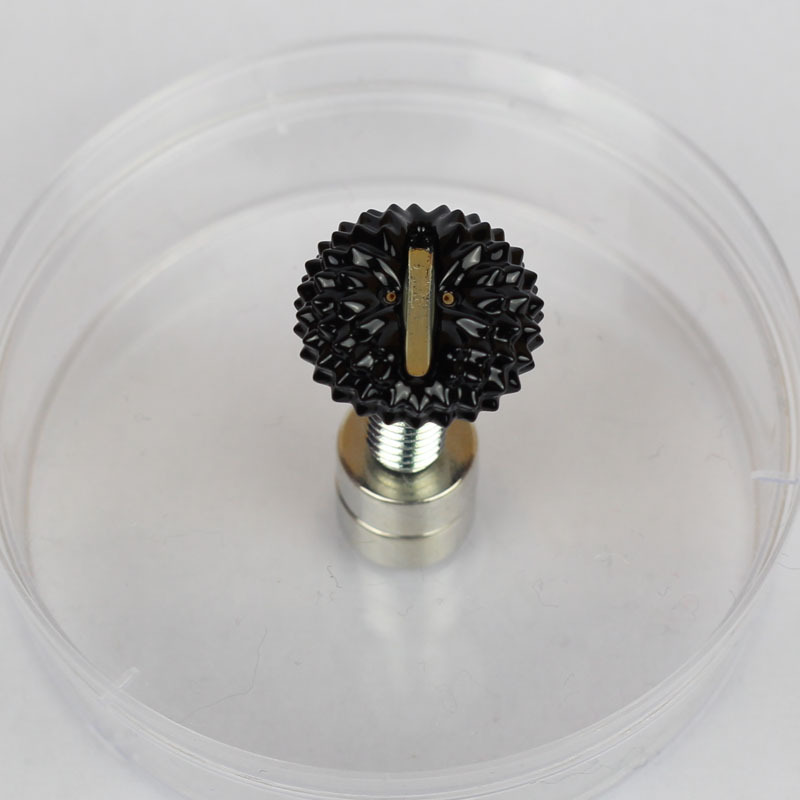 By volume, a ferrofluid is approximately 5% magnetic solid, 10% surfactant, and 85% carrier. When no external magnetic field is present, the magnetic moments of the particles are random, and the fluid is not magnetic. When an external magnetic field is applied, the magnetic moments of the particles orient themselves almost instantly to the magnetic field lines of the external source. When the magnetic field is removed, the particles go back to random alignment very quickly. 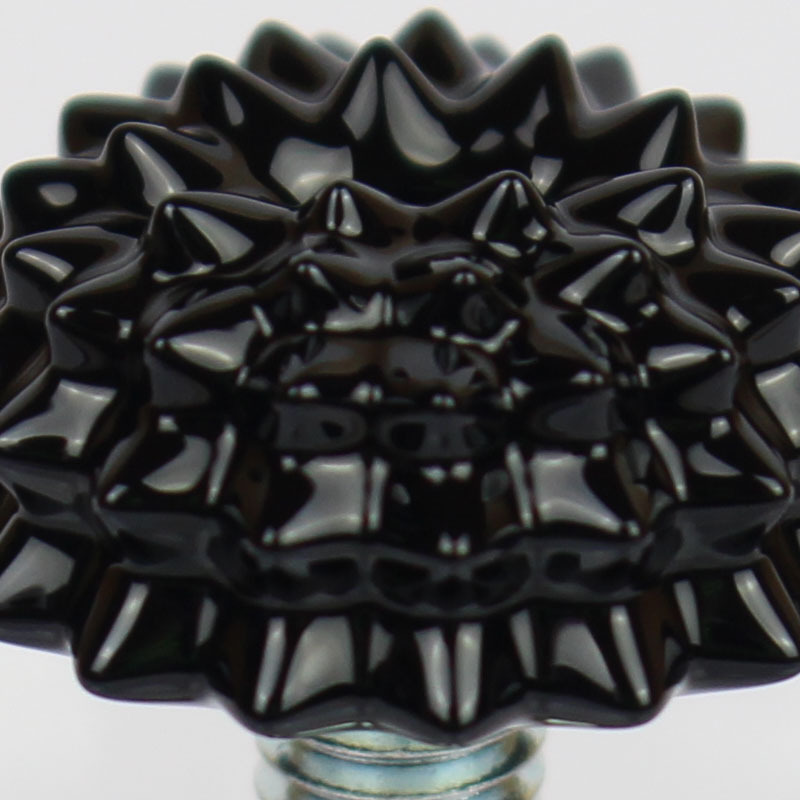 A ferrofluid will always tend to move to the region of highest flux. This can create some VERY interesting patterns when magnets of different shapes are used! 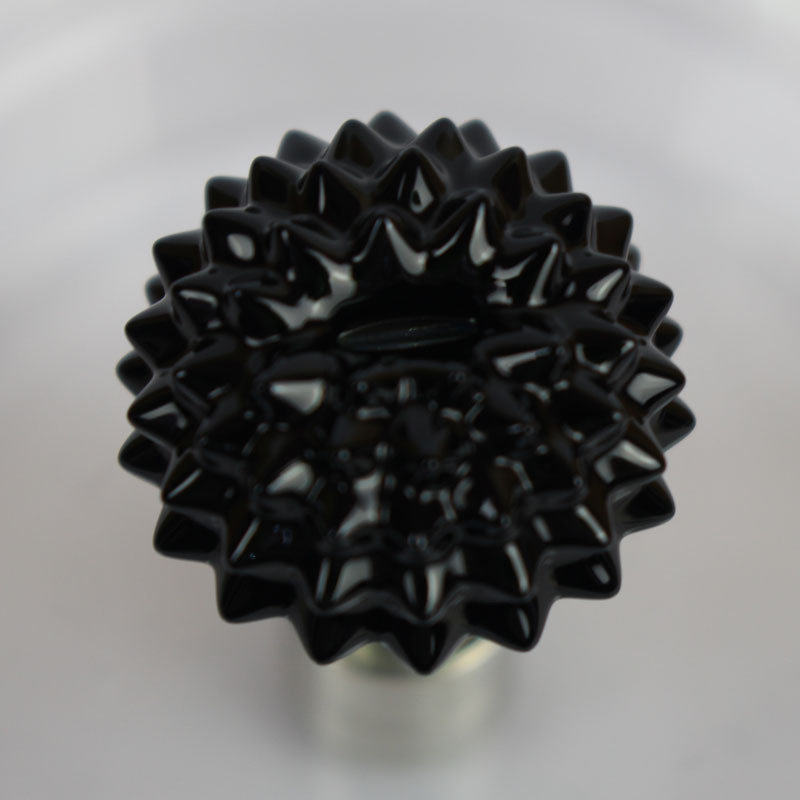 The spikes that stick up from the ferrofluid show you the field strength at that spot. Lots of very small spikes indicate a stronger field; fewer large spikes indicate a weaker field. 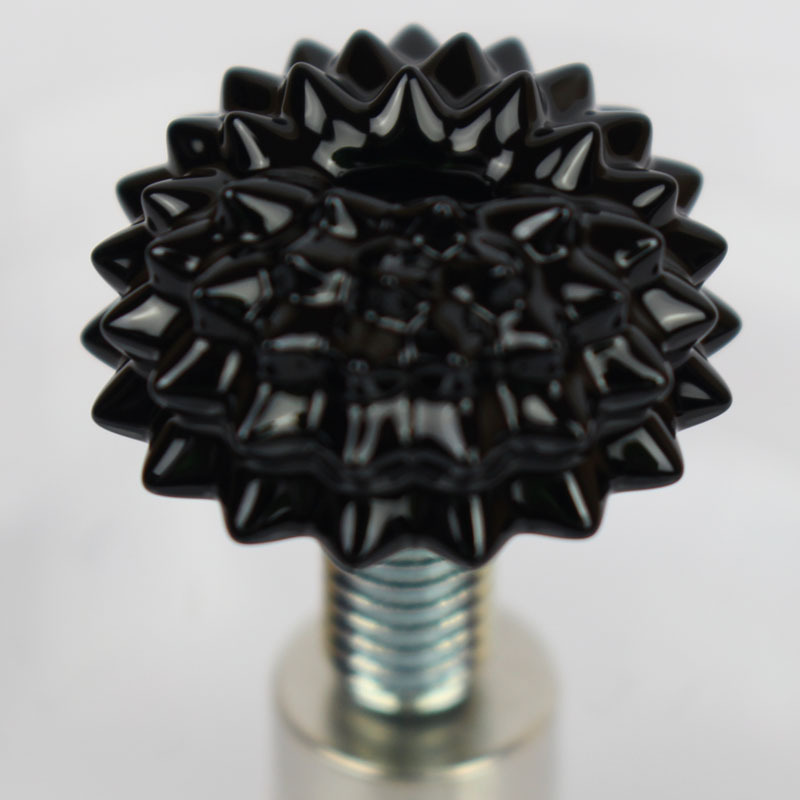 There are many commercial applications for ferrofluid; from liquid seals in hard drives to contrast agents for magnetic resonance imaging. One of the more interesting applications is in the use of ferrofluid-based ink by the US government to print the one-dollar bill. These bills can be read by vending machines, capable of recognizing different magnetic patterns of different denominations. This technology also helps the US government to identify counterfeit bills. To prove this at home (if you live in the US), hold a neodymium magnet to a one-dollar bill and you will see it would be attracted to the magnet. Ferrofluid (10ml), 2 x neodymium disc magnets (10mm x 5mm), 2 x pipettes (0.5ml), petri dish (50mm X 10mm), pair of nitrile gloves (medium), bolt, nut, and a totally awesome MP button badge. Warning: The material in this kit is safe when using as directed. However, it contains chemicals that may be harmful if misused. Please note that handling ferrofluid can also be quite messy if handled recklessly. 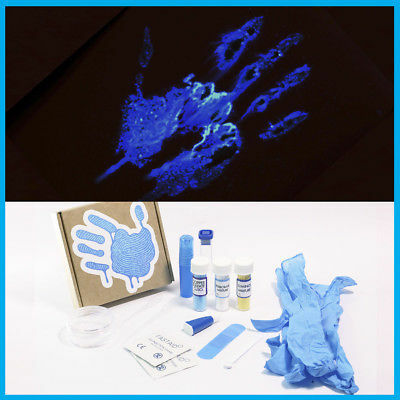 Therefore, we recommend this kit for hands-on use with children over 13 unless they are under the supervision of any adult to prevent any damage or injury. 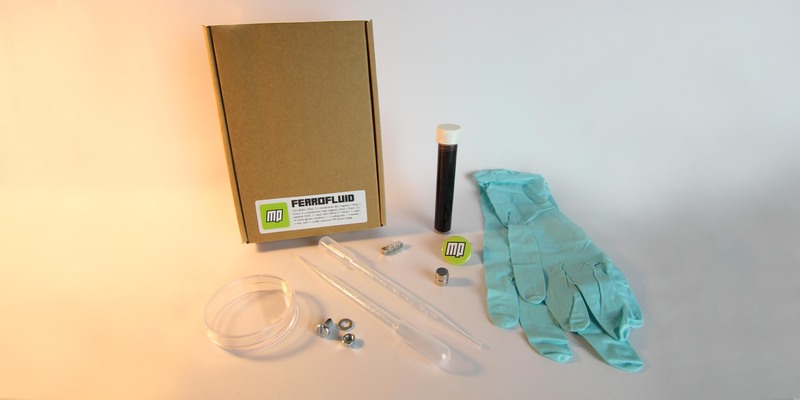 Wear nitrile gloves whilst performing the experiment as ferrofluid will dye skin. If contact occurs, wash with soap and water. Precautions must be taken to prevent contact with surfaces and fabrics as ferrofluid will stain them. We recommend working on newspaper or paper towel to prevent the ferrofluid from staining the surfaces. 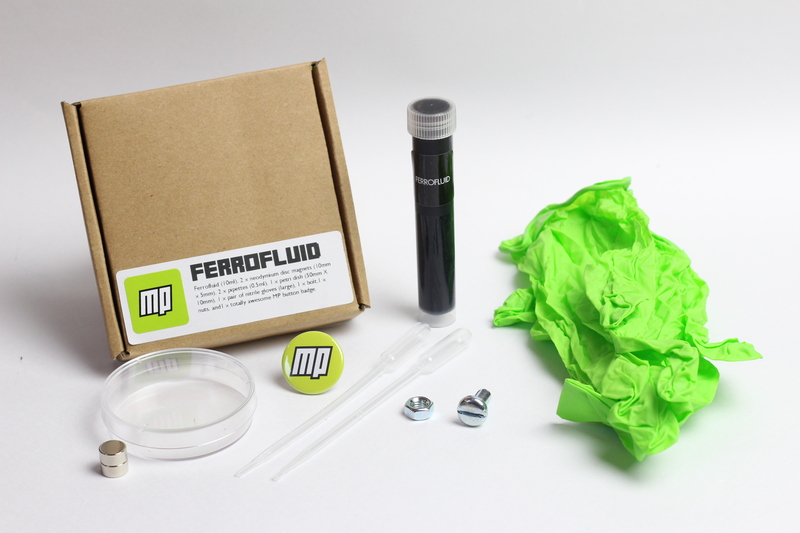 Ferrofluid is relatively non-toxic and can be simply thrown away when finished with, or can be pipetted back into the container for re-use – though eventually it will dry out. Before starting the experiment, it is important that you read the following warnings. Prolonged or repeated contact of ferrofluid on skin or eye contact may cause irritation. Ferrofluid has minimal toxicity, but fluid aspirated into the lungs during ingestion could cause severe pulmonary injury. You should not induce vomiting and should seek medical attention if the material is ingested. Users should be aware that a very small percentage of the population may display unexpected allergic skin reactions upon contact with the ferrofluid. We advise people to wear protective glasses. KEEP NEODYMIUM MAGNETS AWAY FROM MAGNETIC STRIPS ON CREDIT CARDS AND ELECTRONIC DEVICES.